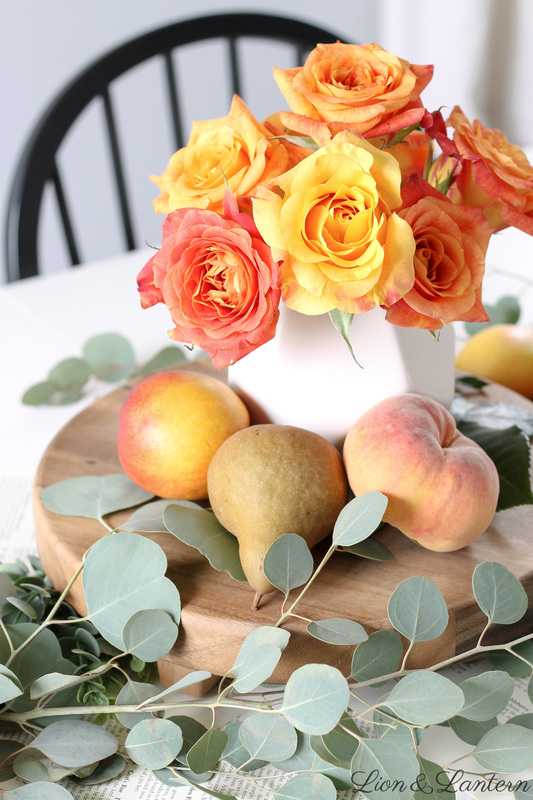 Fresh fruit and florals provide the colors of the harvest season while keeping our decor budget friendly. 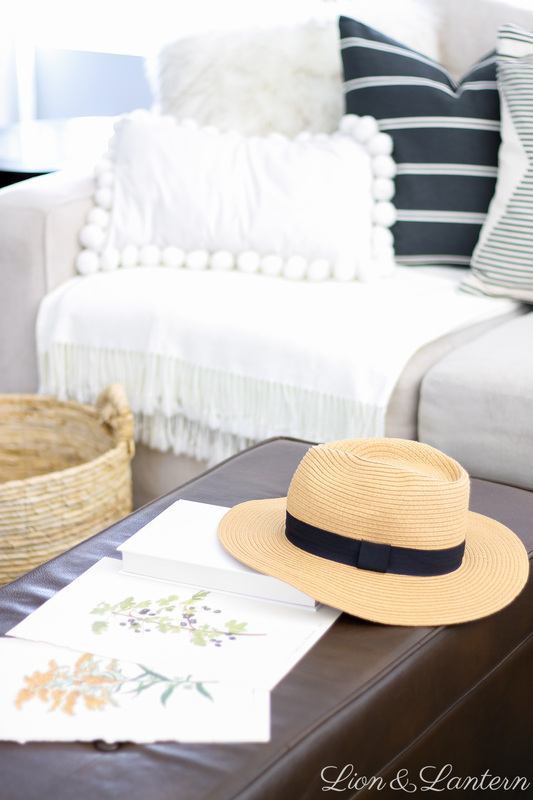 Baskets, throws, and wood tones warm up any space. Grab a cozy drink and come enjoy our fall home tour! 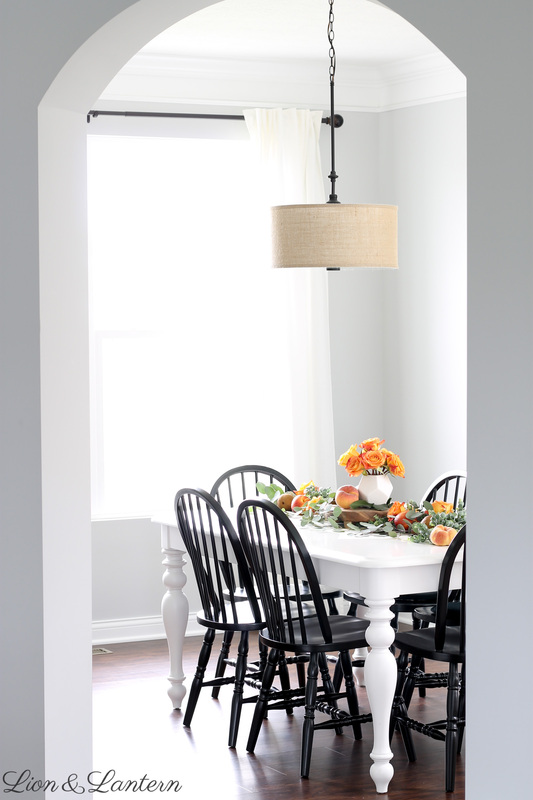 Friends, it’s a very exciting day–fall home tour day! 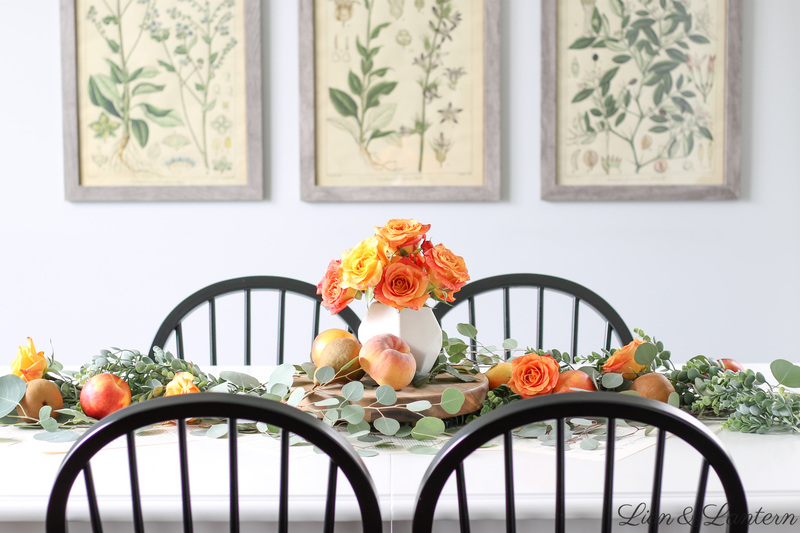 Today I will be walking you through our home styled for autumn. I’m so excited to be joining a fall blog hop hosted by Lindsay from Aratari at Home. If you have arrived from Kelly’s beautiful home over at The Tattered Pew, welcome 🙂 I’m Caitlin and I’m so happy to have you! You can read more about me and Lion & Lantern here. 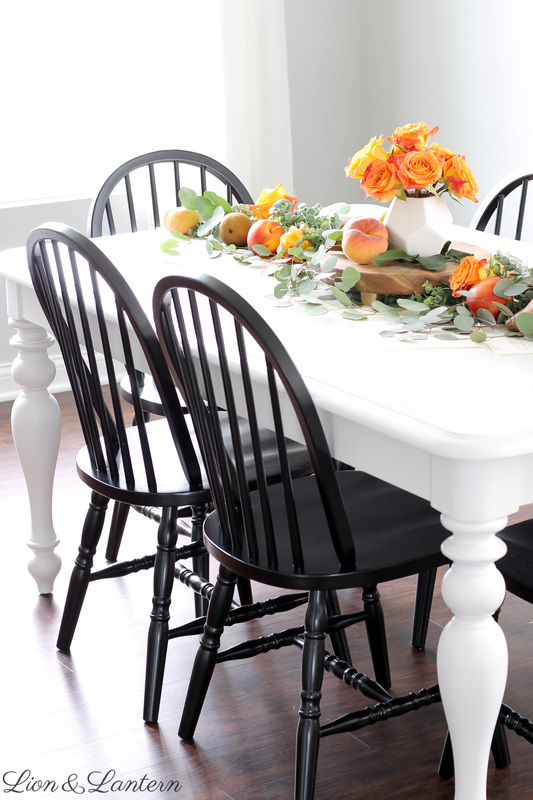 For now, cozy up and let’s get started on our fall home tour! 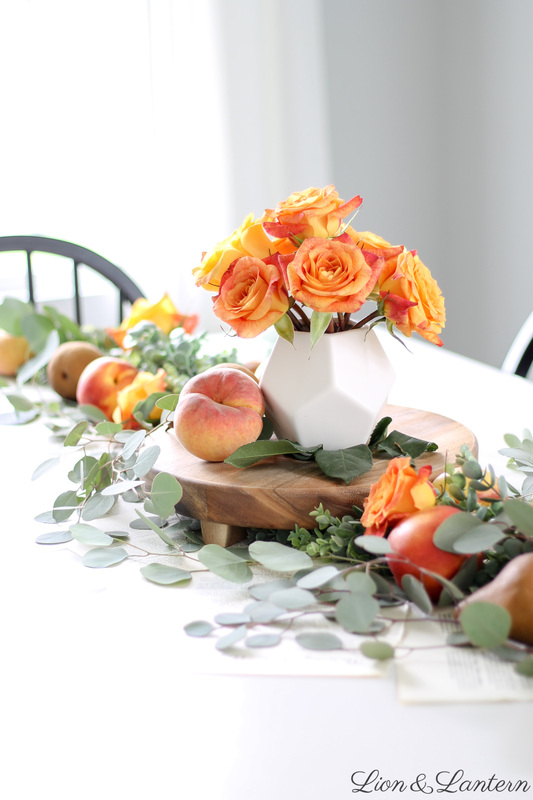 To dress up our dining room for fall, I created a simple centerpiece out of fresh fruit, florals, and greenery. Honestly, I haven’t been able to hunt down pumpkins yet this year, so I worked with what I found at my local grocery store. I love the harvest colors of nectarines and Bosc pears, and also discovered something called a donut peach (!!) 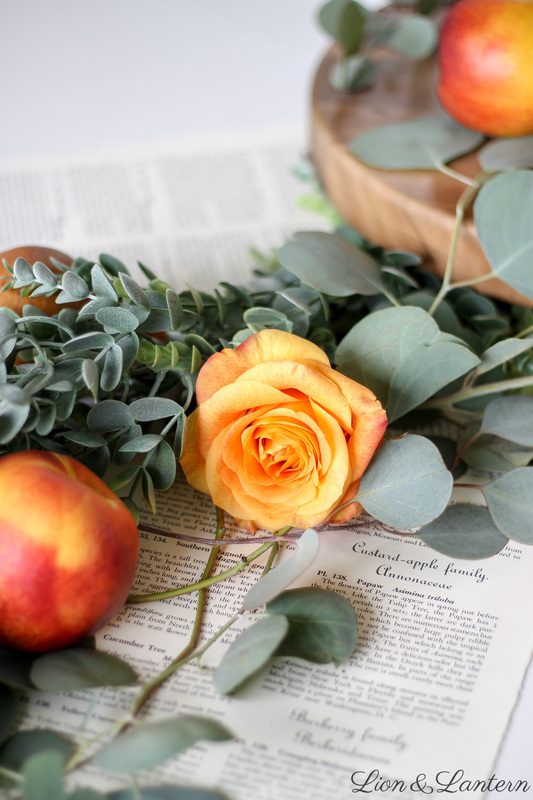 that has a shape reminiscent of a pumpkin 🙂 I used fresh eucalyptus woven into a faux eucalyptus garland as a base, and these gorgeous orange and yellow roses were on clearance! 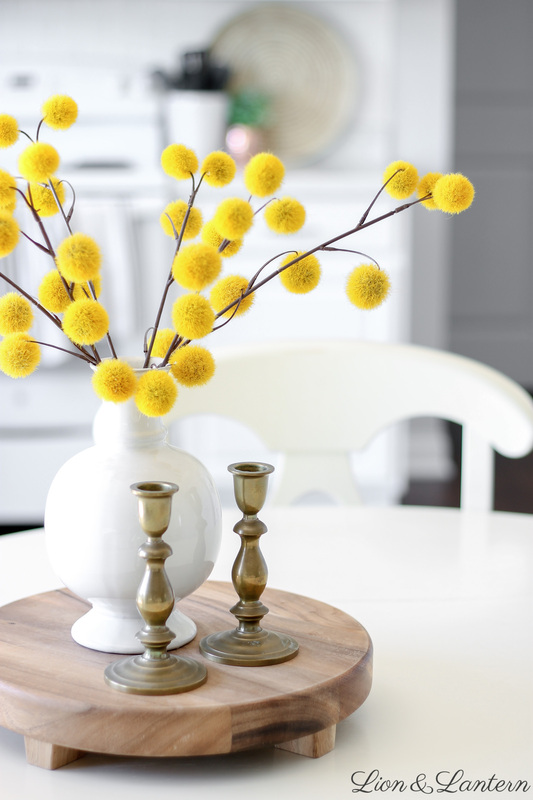 They work perfectly as a centerpiece to pull the look together. 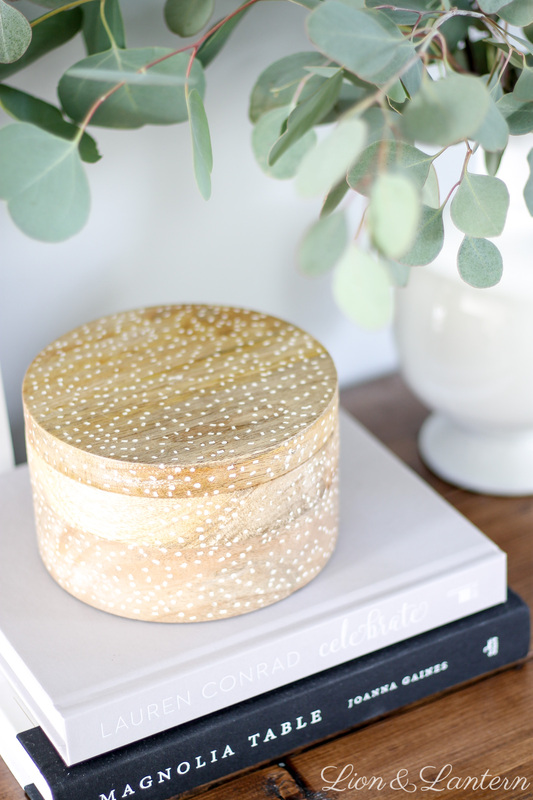 If you’ve been around the blog before, you know that I love decorating with book pages! You will see them all around our home. These pages are from the same botanical book I used here (I have the specific book as well as other suggestions linked!). I also have a tutorial for farmhouse book bundles here. 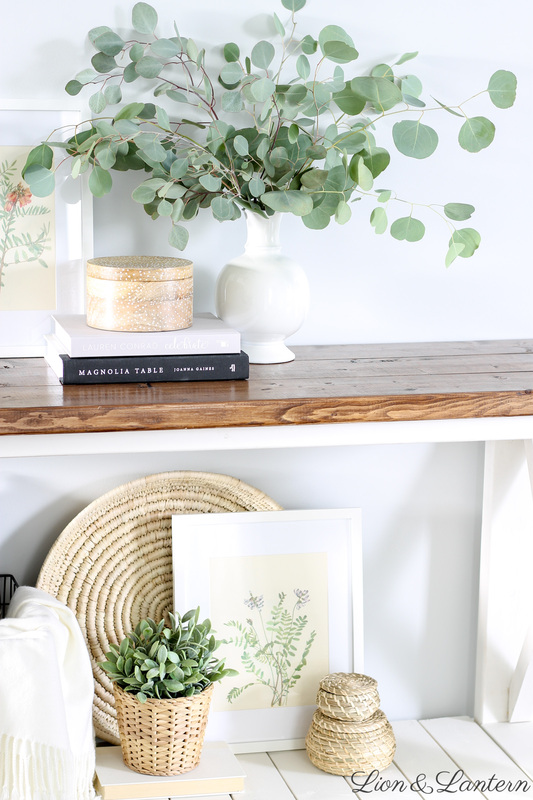 Books and book pages are an inexpensive way to add vintage charm to your space. 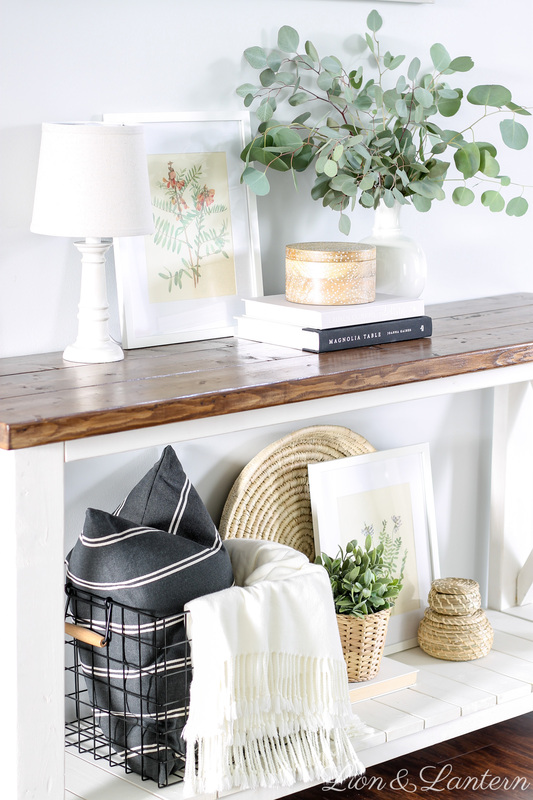 This simple entryway space is right beside our dining room, against the staircase. 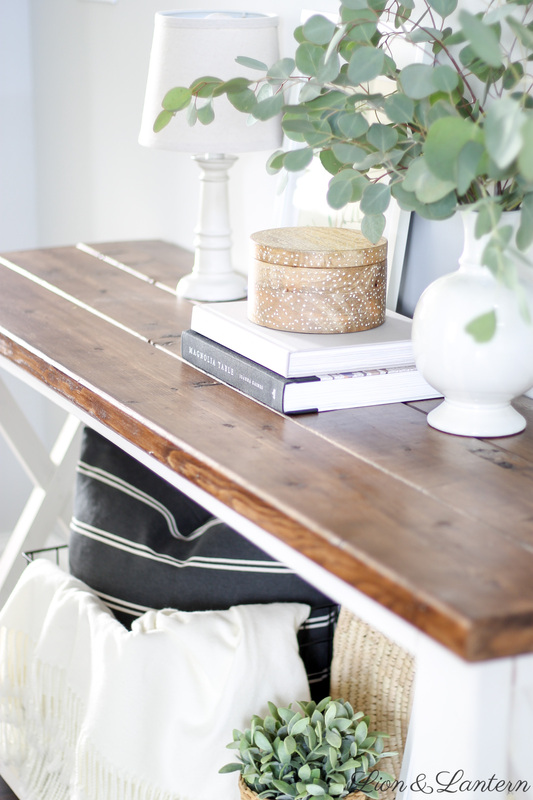 I love the structure that this console table adds! 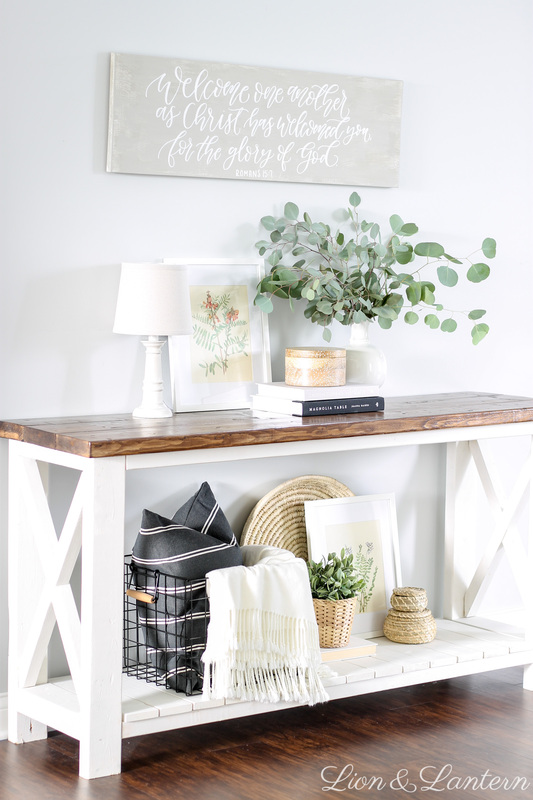 A friend built it for us based on the Ana White rustic x console, and it is one of my favorite areas to style for the seasons. For fall this year, I wanted to keep things simple. 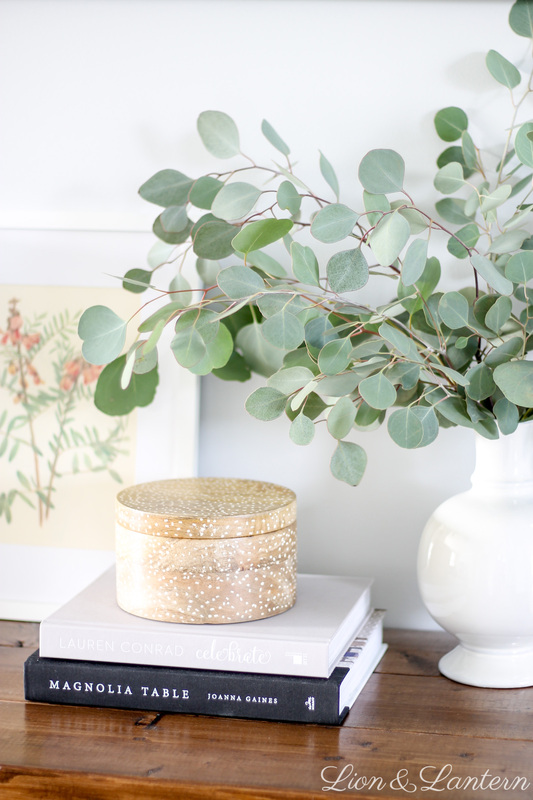 I used several bunches of eucalyptus from my grocery store in a white vase to bring the outdoors in. A dark gray pillow adds a bit of moodiness to the space, and the throw blanket is welcoming and cozy. The wooden container and woven accents add warmth. Finally, I used two more book pages for the botanical artwork. 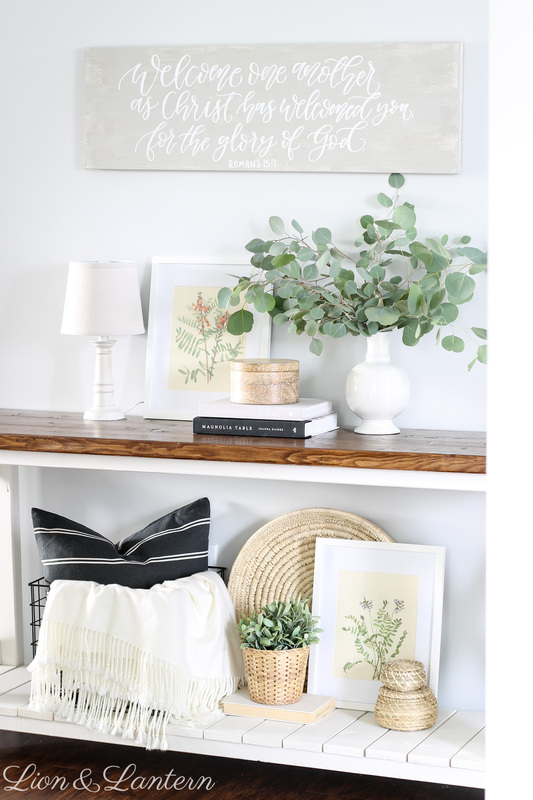 I painted the farmhouse calligraphy sign myself, and while I do not have a tutorial for that, I do have a calligraphy scroll tutorial that you may enjoy! Last year I used white pumpkins in this space, and I do think it would look nice to replace the woven baskets and planter with some pumpkins here. 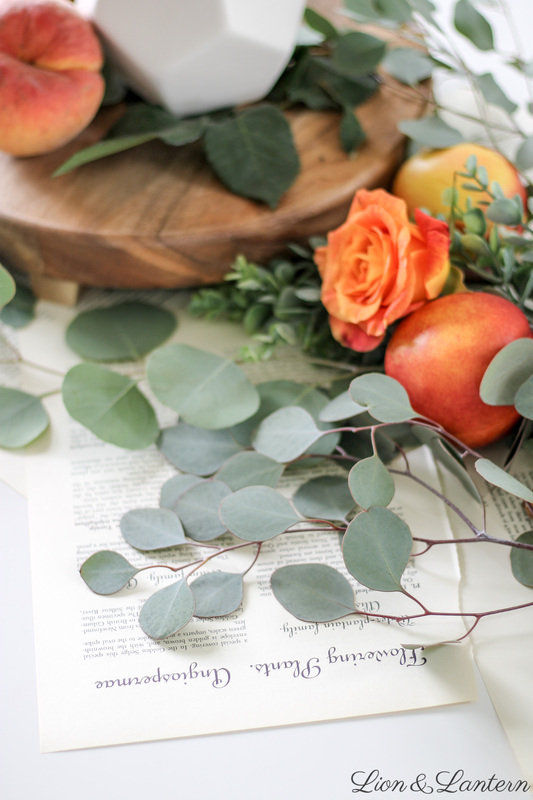 I may do that later in the season, but for now, I am happy with the subtle fall feel created with the fresh greenery and decor items I already had! 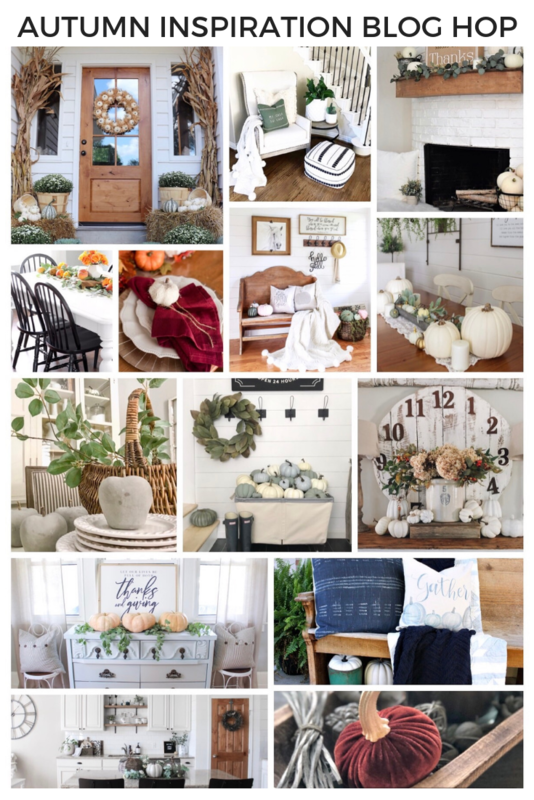 It just goes to show that you do not need a large collection of outright seasonal decor to style your home for fall. 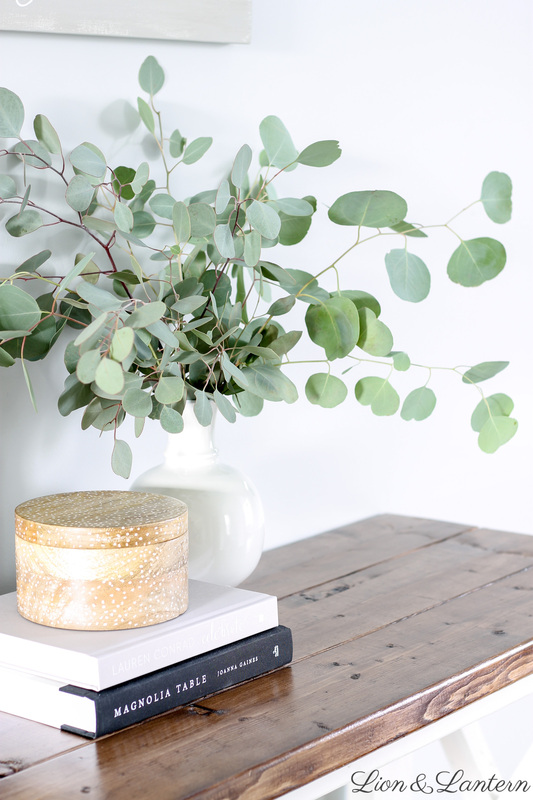 I already shared our fall living room and shelf styling, but thought I would include a few photos here to make this fall home tour complete 🙂 Check out those posts for sources and more cozy photos! 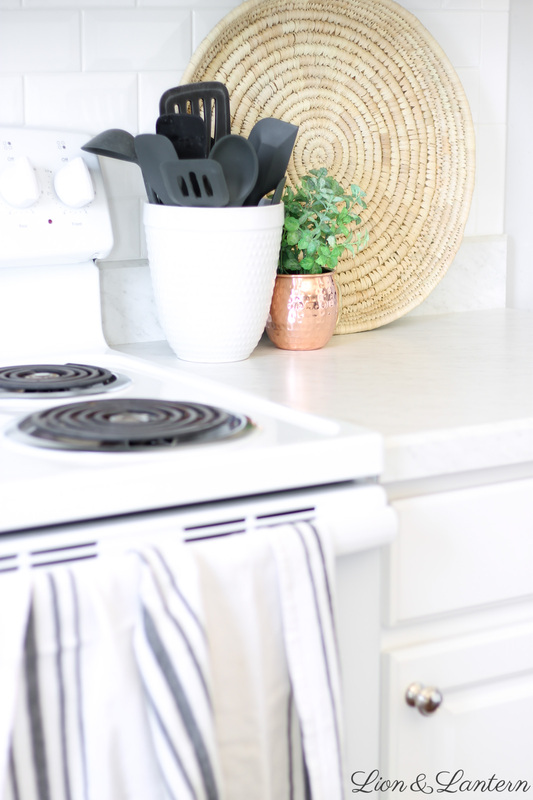 Again, you can see our full fall kitchen tour here, but this is a little peek! Thank you so much for stopping by today, friends! 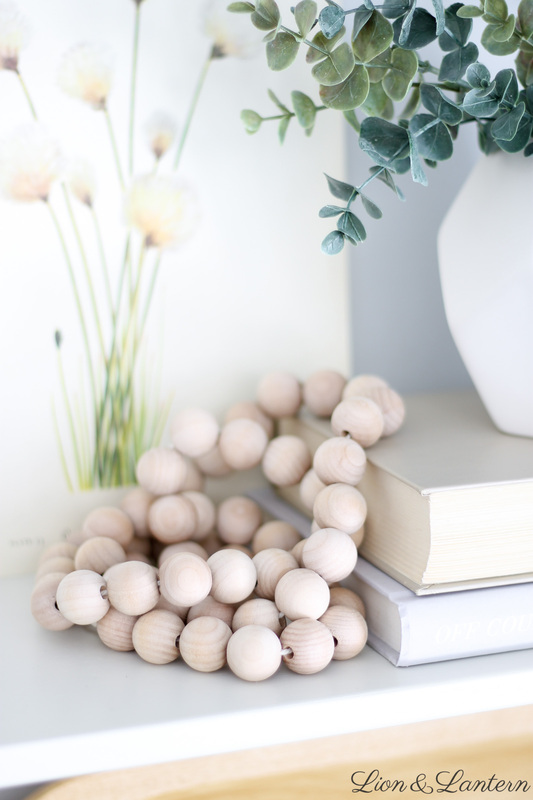 I invite you to continue the blog hop by heading over to Jessica’s beautiful home at Patina Gray. Here is the full list of all of homes on our fall home tour! Thanks so much Lindsay! I’ve loved touring everyone’s homes! Sometimes you just have to work with what you get, right? When life gives you nectarines! Using the florals and fruit was so creative! I love that pop of colour!! Caitlin your home is so bright and beautiful! I love the florals and fruits and the sign with the Romans verse! Gorgeous and so fun joining you on this tour! 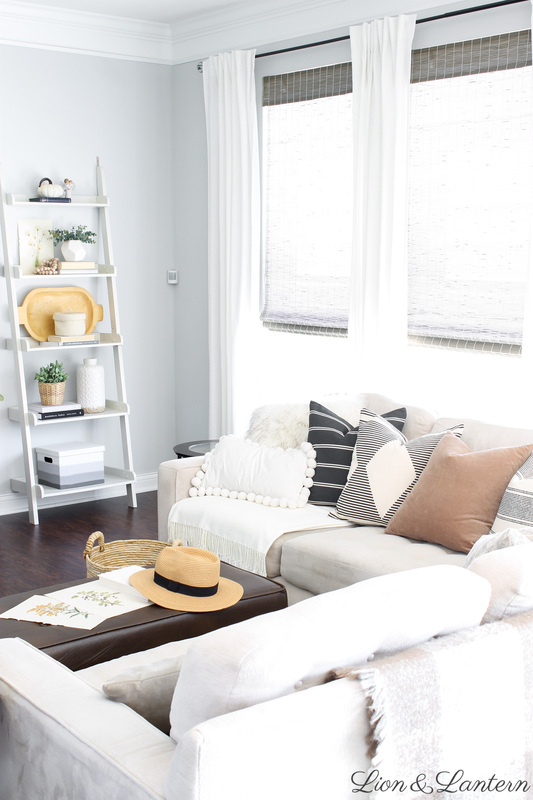 I love all the neutral beauty here with little pops of color! I also love your use of books and book pages. It’s all so lovely!! Nina, thank you so much! 🙂 I’ve loved seeing everyone’s decor on the tour! 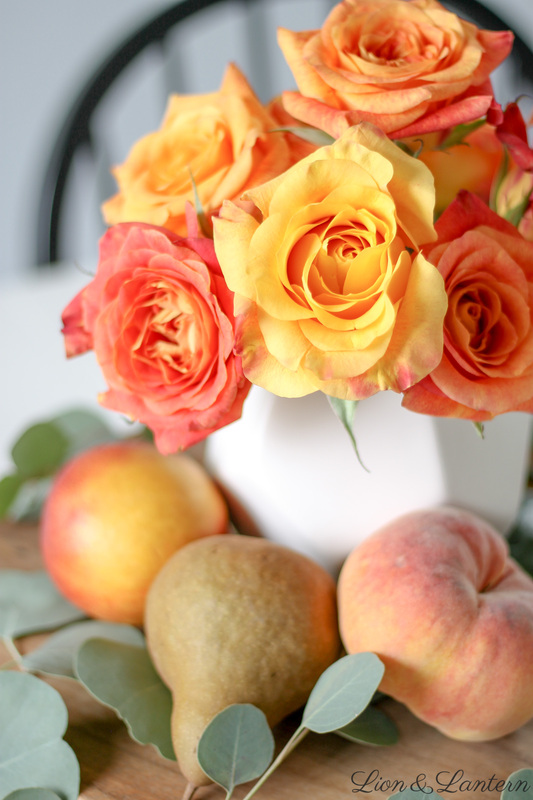 The fresh fruit and florals are a beautiful combination! 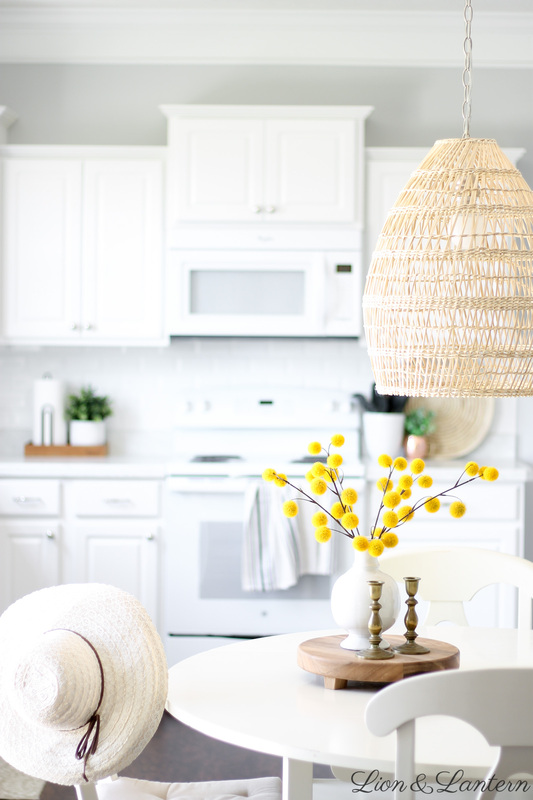 You created so many bright, pretty spaces that make your home feel so inviting!! Beautiful job Caitlin! 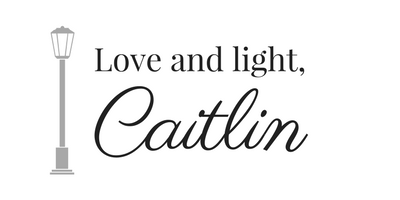 Caitlin!!! This is absolutely beautiful my friend!! I love all of the soft colors and beautiful textures. It all comes together to create such a cozy and inviting space! And your photography skills are on point girl!!! So happy to join you on this tour! Thank you so much dear friend! I’ve loved getting to know everyone! 🙂 Such a fun time of year! All your Fall touches are so lovely. You have the right touch to each room. Very pretty.